We imported Chico from Germany and picked him up when we went to Chorin to observe Bundessiegersuche. 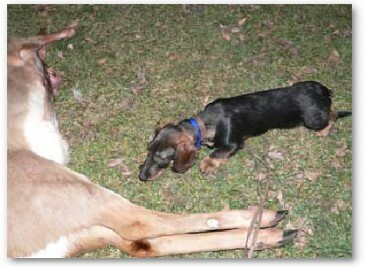 Altogether it was a 27 hour trip back home but Chico took it in stride and never let out a single whimper. It was a treat to meet Chico's breeders, Ilke and Seffen Becker, and all the Chico's relatives, including his parents, Maurice and Mercedes. 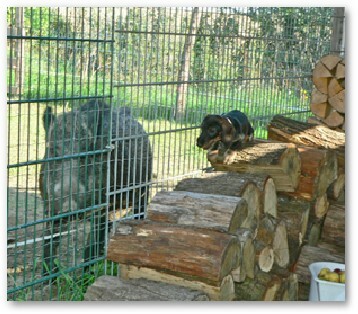 We really enjoyed having seen Chico on his home turf, and especially his interaction with Lilly, the wild boar. 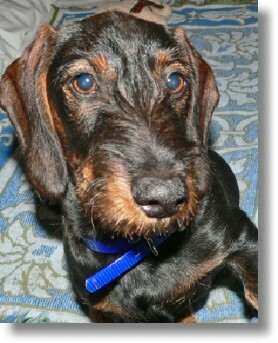 We have high hopes for Chico as we are in a need of an outcross in our breeding program. As breeders we know that puppies are always a gamble, but we hope that Chico with a proper training will fulfill his potential and will make his breeders proud. We count on you Chico! He has already opened on rabbits. 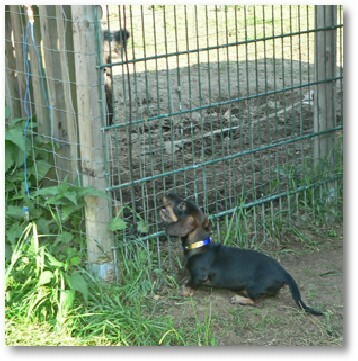 At his breeders' home in Germany - Chico is playing with Lilly. We love Chico's intelligent expression!